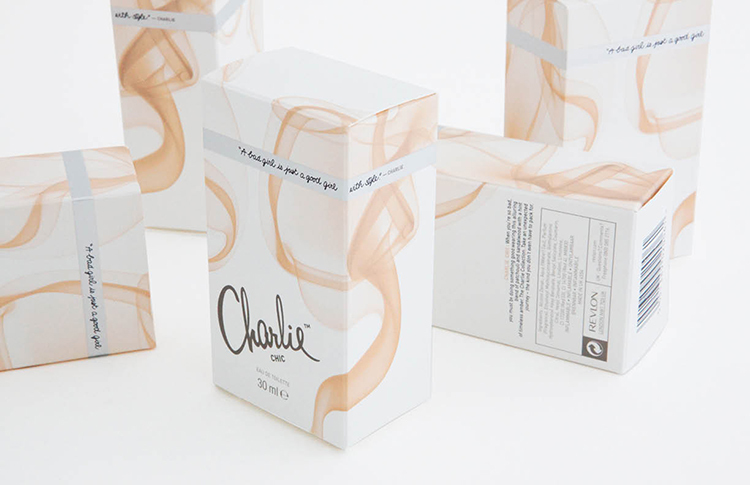 charlie is one of revlon’s most iconic fragrance brands which made waves upon its original launch back in 1973. since then, the brand lost its cache and was pushed into drugstore distribution, with mainly body sprays as its core business. 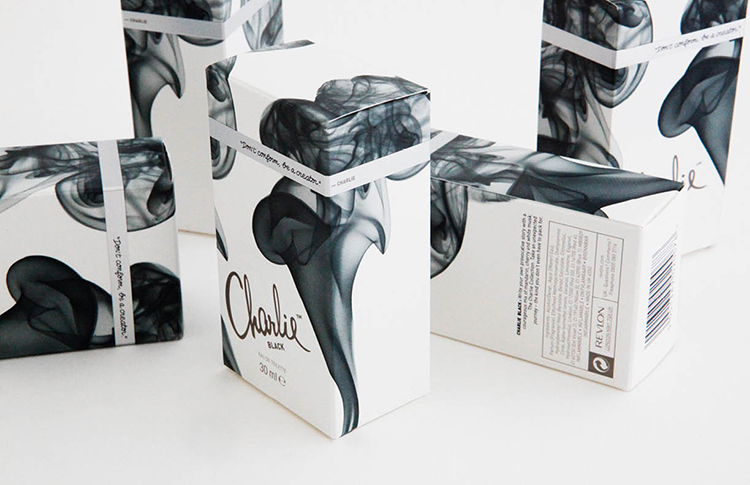 the original brand had such impact that even today, charlie is mentioned in nearly every fragrance launch strategy. after discussions with revlon, ceft and company decided upon two routes for the brand: they could allow the brand to slowly phase into oblivion and continue to fund new ventures under new names, or invest in the historic brand to revive it as has been done with burberry, hush puppies, and other iconic brands that made a comeback after temporarily suffering. the agency created lead-in copy on the back of pack for each scent, rather than abandoning it to legal and ingredient data. the immediate need for the brand was to redesign the dated packaging that through time had taken turns in various ways, creating an inconsistent and disenchanting image. 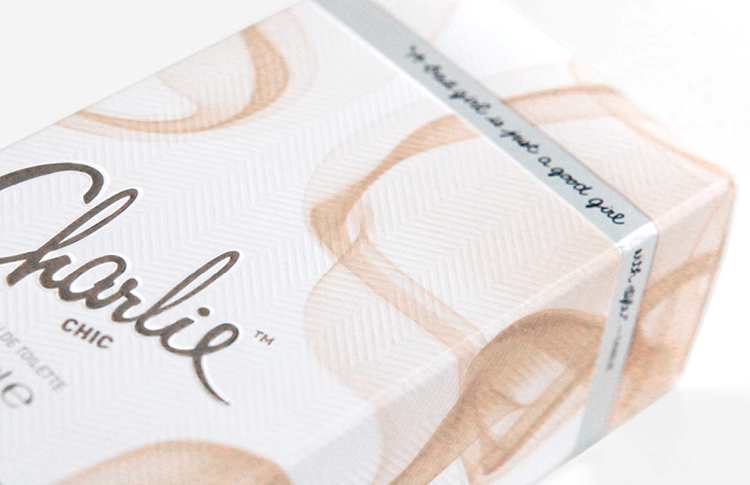 charlie was confident and inspirational; each redesigned pack displays its own charlie quote. for instance, “a bad girl is just a good girl with style.” the subtle texture, resembling a herringbone finish, was designed by ceft and company and applied in the printing process to the paper stock in key areas. the new design translated seamlessly from EDT to body fragrance, you can see the range of body fragrances here. four unique directions were presented and tested in key markets by revlon. 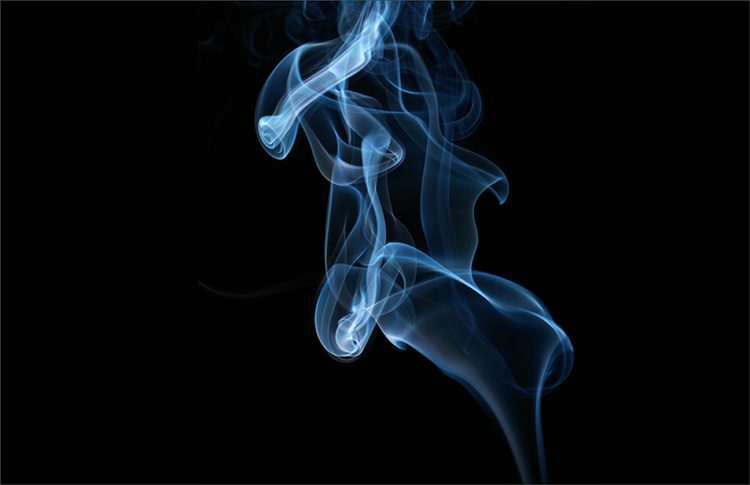 the winner was the “scented wisp” design. it was chosen as the interim packaging alternative while long term relaunch plans were being discussed. 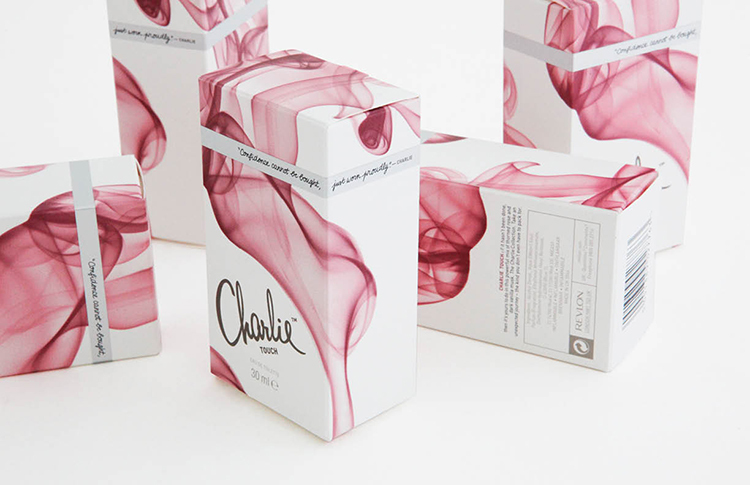 the “wisp design” allowed charlie to project a visual cue, evoking a sense of aroma and scent dispersion. combined with various hues, the colors influenced the viewers perception of their scent composition; lighter for more floral and citrus, and darker for oriental and wood. 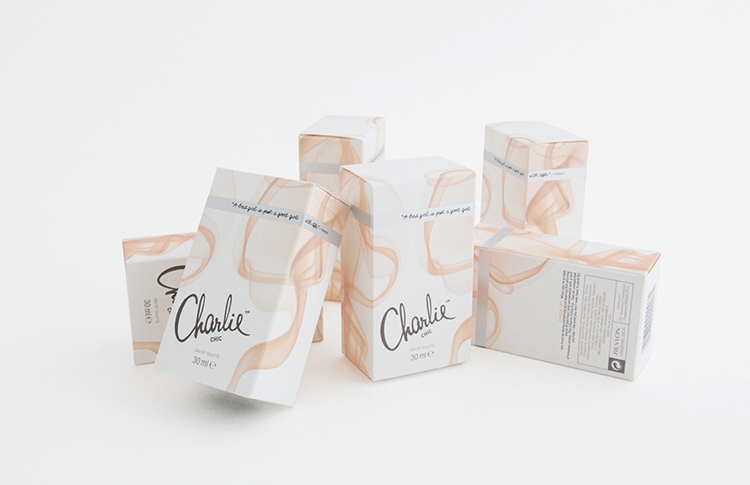 one of the many “wisps” created specifically for revlon’s charlie packaging. every detail, including the language on the packaging, was thought through. there was changing, adding, removing what was unnecessary and simplifying the elements to create a premium looking product. the dated logo was redesigned as a traditional stage. it was mutually agreed upon to retain the original logo with minor modifications. for example, “perfumed deodorant body spray” was changed to “body fragrance”. in the absence of advertising efforts, brand personality was injected through the custom quotes generated by the agency. the production retained the same six color printing plates used on previous packaging design to avoid additional expenditure. while adhering to the legal requirements of various countries, the agency simplified and reorganized the back of packs. unlike most designs, the back of packs do not simply contain information, but are beautifully organized like pieces to a puzzle. as ucef hanjani, the agency’s founder and executive creative director states, “the spine and back of a book is often more important than the cover of a book. this is what the consumer sees upon inspection, and here is where one can judge if the product was worthy of care and love”. likewise, the back of pack design tells more about the product and attention to detail than the front of pack. the packs had to carry color references to the existing range. the wisp allowed recognition through color while updating the range in a consistent manner. the paper stock was changed from the generic coated paper associated to nearly all ubiquitous products on the market, to a textured matte paper. the extremely subtle texture was designed by ceft and company and applied in the printing process, resembling a herringbone finish that gave the brand its strong, somewhat masculine touch to contrast the seductive silky “wisp design”. the agency worked within the existing production budgets, working closely with printers in various countries to create a premium finish without heavy expenditure. 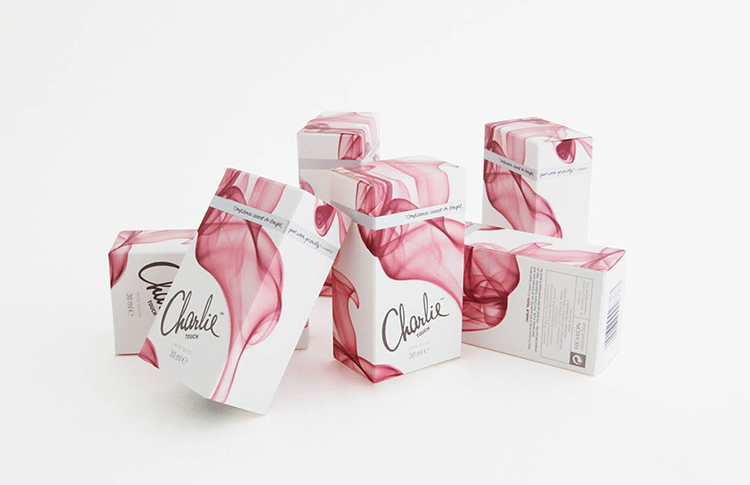 the charlie eau de toilette range consisted of four fragrances, charlie chic, charlie black, charlie touch and charlie pink. the matte silver foil band gave the product a touch of premium finish without the shine and loudness associated to mass products. charlie black was the embodiment of charlie: strong, elegant, understated and never for the faint-at-heart. this was our favorite in the range, and while it may never become the most popular, it’s sure to attract a certain type of woman who is fearless and confident. she is our charlie. view all work related to this project.